As a condition of sale, or the transfer of property ownership, most cities and counties require compliance with specific “Water Conservation” and “Health and Safety” requirements. These requirements are collectively referred to as “Retrofitting”. Please click here to see a list of various city and county compliance requirements. • A new California law requires all “dwelling units intended for human occupancy” that have fossil fuel-burning appliances, fireplaces, or an attached garage to be retrofitted with a carbon monoxide (CO) detection device. • Single-Family Homes on or before July 1, 2011. • For all other dwellings, owners will be required to install the devices on or before July 1, 2013. • The devices may be battery-powered, or a plug-in device with a battery back-up; and must be tested and certified pursuant to the American National Standards Institute (ANSI) and UL. • The device may be combined with a smoke detector, but must also emit a distinct alarm, to signal the presence of dangerous CO levels. • All devices must be certified by the State Fire Marshall. • Unlike smoke detectors, CO devices must be replaced at least every 7 years. • Single-family homeowners will be given a 30-day notice to correct a violation of this new law prior to being assessed a fine. • After July 1, 2013, Landlords will be required to install, test and maintain CO devices in rental units. • Water Heater Bracing/Strapping. California Health and Safety Code: Section 19211. • Water Heater Temperature and Pressure Relief Valve Discharge Pipe. In order to determine if a property complies with its city or county’s requirements, a “Retrofit Inspection” is performed to determine if the property is compliant. If the property does not comply, then specific corrections are recommended so the property may become compliant. The Contractor Connection specializes in making any corrections necessary so your property satisfies all retrofitting requirements. Once it is determined, through the “Retrofit Inspection”, that a property is compliant, a “Certificate of Compliance” (Water Conservation) and “A Report of Compliance” (Health and Safety) is issued to the seller and/or escrow company by The Contractor Connection to verify successful compliance. Some cities and counties require specific and unique forms and reporting procedures to assist with the verification of property compliance. 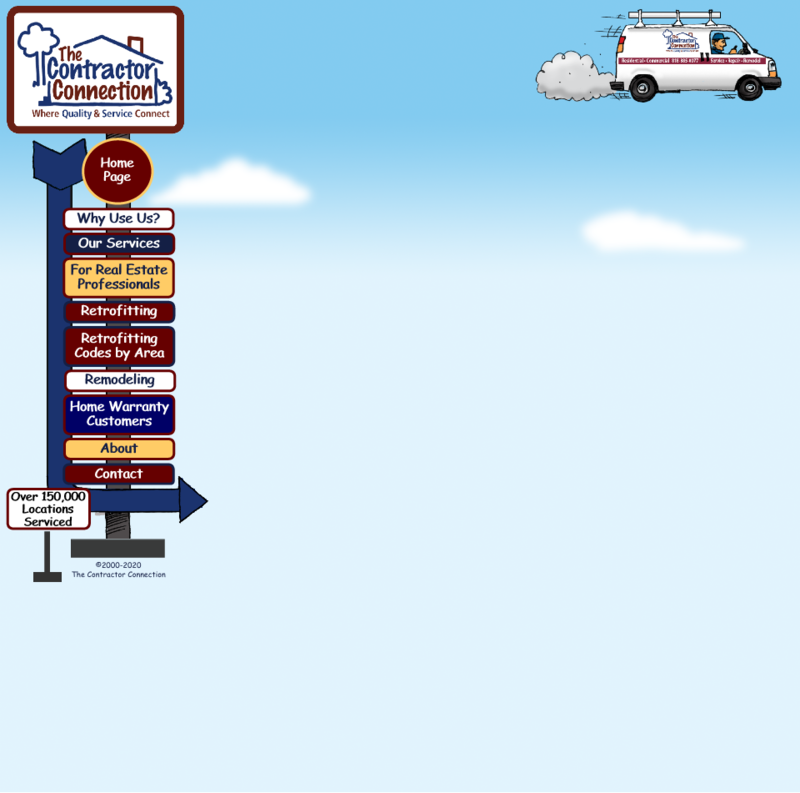 The Contractor Connection is familiar with each city or county’s requirements. In many cases, cities and counties differ regarding their requirements for compliance. Please click here to see a list of various city and county compliance requirements.